My guitar has always been my best friend. I'm sure the friendship will be a lasting one and I'm happy for that! Sungha Jung is a real phenomenon! Who would have thought that a finger style guitarist, a string plucker, would one day need security guards to prevent him being mobbed by screaming teenage girls? But it’s true; his concerts in Asia have a huge teen following for some of whom he has become a youth idol and for many others an example to look up to. 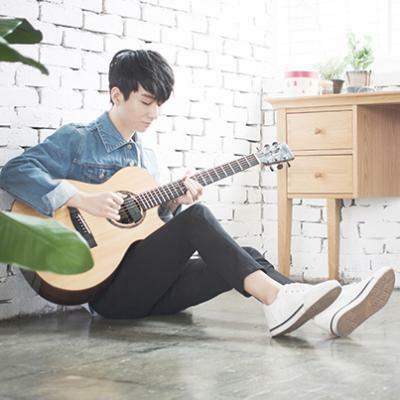 Sungha Jung has a cool, youthful appeal with which he has repositioned the acoustic guitar to a new status. His example has made the guitar suddenly really cool! He has developed serious credibility and now finds himself on the radar of many international heavyweights. His numerous concerts include European and American appearances with stars such as Jason Mraz, Paul Gilbert, Andy McKee and many others. But what is his secret recipe? It started with video clips which he posted on YouTube, in which he played his finger style* acoustic guitar arrangements of rock, pop or film sound tracks. As a result he popped up ever more frequently during searches not necessarily aimed at him. Of course when encountering a 9 year-old playing incredible guitar, one will tend to keep watching. This got around slowly at first but then more and more quickly. Obviously this was not just another case of smoke and mirrors – the guy was a really superb player! And, wait a minute, how old did you say he was? What, 9 years, or maybe 10? Unbelievable! What’s more, he was uploading new material every week and improving every time. To cut a long story short, he has now had 500 million video clicks and 2 million subscribers on his YouTube account. And yet he remains the same relaxed, nice guy who still uploads at least one video clip every week, mostly from the same couch. One of his most important mentors and examples (he no doubt has many others) who deserves mention, for without him history would have evolved differently, is: Ulli Bögershausen. He discovered Sungha Jung on the Internet very early and took him by the hand. No guitar tuition was necessary but Sungha learned much in the fields of composition and arranging from Ulli. At this stage Sungha Jung has released 3 albums, all recorded at Ulli Bögershausen in Germany and featuring increasingly more originals. You will find some information on the Sungha Jung model here.